Each year, our nation's courts process over 11 million low-level crimes, many of which involve repeat offenders. In 2000, an experimental court opened its doors in Red Hook, Brooklyn-a neighborhood plagued by a cycle of unemployment, poverty and crime. This new court seeks to stop the cycle of crime, and heal the surrounding community. It is at the center of a legal revolution-the community justice movement. Over the course of nearly two years, the filmmakers were granted unique access to film the daily activities of the Red Hook Community Justice Center, a pilot project in Brooklyn that houses a court and an array of social services. RED HOOK JUSTICE takes an in-depth look at the defendants and staff who are part of this experiment. This is a court that wants to give offenders a second chance. Before resorting to jail, the Red Hook judge mandates extensive drug treatment, job training and community service. But it's no easy way out. The Justice Center has an unprecedented involvement in defendants' lives, and cases that would be closed quickly in traditional courts can extend over many months. 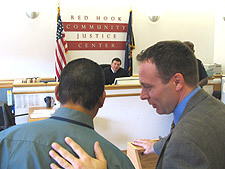 RED HOOK JUSTICE focuses on the dramatic stories of three Red Hook defendants and a handful of staffers at the Center. As the cases unfold, we see that the theories behind community justice and the reality of this new court are rarely in synch. 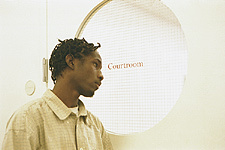 The cameras capture intense vérité scenes of intake interviews in the Center's holding cells, arraignments and other court proceedings, heated staff interactions, community meetings, counseling sessions, and other day-to-day workings of the Justice Center. Characters include: Anthony and Michael, orphaned teen brothers who fight to resist the pull of the streets; Letitia, a heroin addict who struggles to kick the habit when she gets pregnant; Leroy, a court officer who grew up in the Red Hook housing projects; Brett, a dedicated Legal Aid attorney who wonders if the new court helps or hurts his clients; and Judge Calabrese, who takes a hands-on approach with defendants. The story of RED HOOK JUSTICE resonates far beyond Brooklyn. Today there are dozens of similar courts opening throughout the United States. Background Info, Filmmaker Bio and More! The contentious debate over gun control, as seen through the eyes of two mothers on opposite sides of the issue.